I've done a little more reading about the effect where the red laser kills the glow from the GITD surface. Wikipedia's article on phosphorescence gives enough background for this. Basically when a phosphorescent material is excited, instead of dropping down to the ground state quickly like seen in fluorescence, the electron in the excited state undergoes an intersystem crossing to a state of lower energy but higher spin multiplicity. The electron becomes trapped here because the transition between this triplet state and the ground state is actually forbidden by quantum mechanical selection rules, and it takes perturbations from the surroundings to change the geometry of the molecule enough to make the probability of this transition nonzero. But when we hit it with the red laser (which does not have the energy to excite the GITD material on its own) it excites electrons trapped in the triplet state, which then have enough energy to make an intersystem crossing back to the singlet state, and from there it can emit nearly immediately by fluorescence and fall back down to the ground state. This may sound like a silly question but are you able to get any sort of beam at all with your laser styropyro? I'm sure in a dark room, with fog, and a dark adapted eye, you'd see at least a gray beam or something? I recall getting a very faint grey/white beam with my HeCd using lots of smoke. As in discharging the smoke machine directly into the beam from close range. How much of that was visible UV? I have no idea. HeCd is also 50nm lower (325nm) than Syro's build, so his results may be different. So you should have no problem seeing 405 then diachi. No more 405 is too dim anymore! 405nm still messes with my eyes though, as is the case with most people. Awesome video styropyro! Are you working out of a storage unit now? I agree on the red laser explanation. Saw a very similar demo in an optical engineering class. You should get a filter to block the red and see if you can register the brief increase in light output. Interesting thing about the grey perception. This isn't something that is necessarily has to do with the wavelength alone. But instead is due to the intensity. I have run a 450-460nm LED before in the dark with my eyes adjusted to scotopic vision. I ran it at threshold and I could see light, but no colour at all. The light was grey to the eye. Now our eyes struggle to see UV and has a very low lm/W. So seeing grey light shouldn't come of as a huge surprise IMO, as it appears that our eyes can still detect enough of the UV light to register it. But like the LED, it wasn't intense enough to trigger colour. It makes sense when you consider our rods can pick up lower intensities but not colour in contrast to our cones. SOoooo...SP...Can we generate "Florescent Fog" ??????????????????? An On/Off cycle 405nm...thru a diffraction filter would generate a static multi-beam pattern. I still maintain....this would be a very different and " Organic" display...evolving from a straight line geometry visualization...to a non-linear warp...a twisted and floating ...in the wind... mmmm...something not yet seen. So...What is the " Secret Crabby Patty Formula " to make " Fluorescent Fog " ?????????? Inquiring minds need to know !!! It's a 10 on the " TFOH " meter !!! I just learned about these methods to make a more 'safe' fluorescent stuff that could be used to make fog: Carbon quantum dots. And unlike fluorescent molecules, they can be tuned to any wavelength. I want...Safe, Cheap...and Good :san::san: Yea...Who cares what the Trick or Treat Kiddies breath in....Maybe they can glow in the dark as a side benefit !!! Yikes...Just kidding !!!!!!!!!!! ...HEY ...Mr. Mad Scientist !!! (SP)..WTS ??? The " Gauntlet of Challenge " has been thrown down !!!! Opps...there I go again..." attempting " humor !!! Styro...I state the above...with all due respect !!! Quantum dots are awesome...I've been trying to get some for a project of mine involving dumping 200W of laser light into a cell of fluorescent material to make a massive flashlight. I don't have the setup to synthesize my own ATM (to narrow parameters)...and sources for the stuff are expensive in my excitation/emission wavelengths. I had not seen those vids before, and those were really cool! Awesome to see people doing this stuff at home. Research labs doing work with quantum dots have some of the most diverse groups out there. You'll have a chemist, physicist, electrical engineer, and optical engineer all working together. This is still on my list of things to try out soon! My plan is to mix up some small batches of potentially glowing fog and vaporize them on a hot surface. That way I don't have to dump weird stuff in my fogger just yet. Obviously I can't go too hot or I'll destroy my fluorescent compounds. Maybe use an ultrasonic fogger and a really strong fan or another really good atomizer? While the mist/fog really isn't as thick as glycol fog, it might be good enough to carry a decent amount of fluorescent dye. Addd NoteForward...Full Speed Ahead !!! Seems like GITD Fog would be a novel display...just as a stand alone...with no laser beams ...punching thru...SO...why is it not a product on the market...Maybe...it is also a toxic brew ???? ?...Maybe it IS on the Market ??? Do you like the " TFOH " Meter ????? Zippy sez it is Perfect !!! Note: Just did a quick ebay search for GITD Fog Fluid....No Go !!! Hmmmm..
Styro... SO... For you Halloween entertainment... !!! My Fluorescent Fog cost little cash, It was Green Gnash !! To get a jolt from my Fluorescent commode ! 5 hr later...No reply...Left you'all speechless hey ???? I don't know about the cornea, but the lens certainly does. 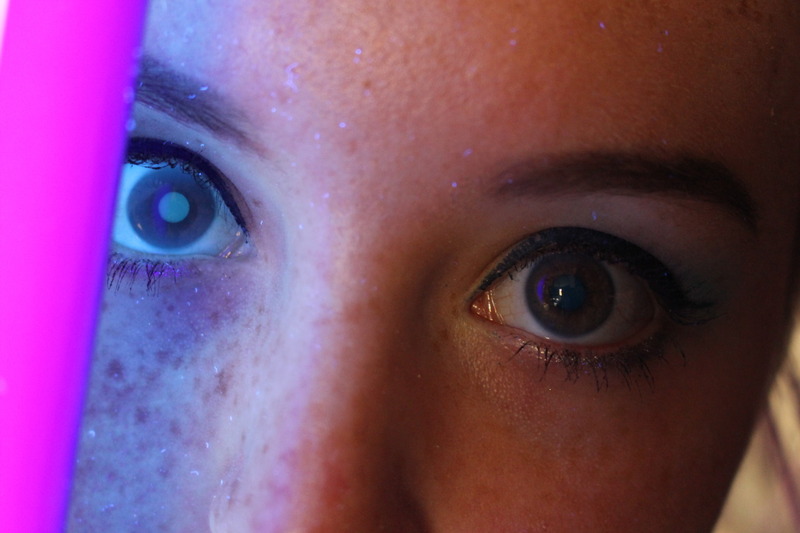 While looking in the mirror, or enlisting the help of a friend, point a black light at your face. (365nm, none of that 395nm rubbish). You'll see this. It doesn't cause color change in a laser dot, but it does cause a "haze" around violet/UV sources. The levels of harm and risk from everything depends on the dose. Ingesting 200 attograms of arsenic is harmless, while ingesting 200 grams of table salt is lethal. I discovered the eye lens floureceing thing a few years ago, weird effect. Showed my wife and tried it on her but it showed little if any effect on her. Were both in our forties, only 19 days apart age wise, no she never had a lens replacement surgery. Maybe mine are "aged" from too much sun or lasers . Side note, my father had his eye lenses surgically replaced. He said he noticed an immediate increase in his perceived color range, especially towards the UV end. After a while, his brain got used to the "novelty" it all but he did say it was strange to see things in a "new light"
My lenses fluoresce when I was 25. It does take a bit of practice before you notice it though, but with enough practice you can even notice your lenses fluoresce when it's bright outside (yes even when it's cloudy).